There is no mistaking a true couture designer. When you walk into the Salon, it truly is like walking into an artistically serene dream. Nearly 1200 tiles line the runway, over the prints that will light up the collection. It’s a perfect precursor to the beauty that’s to come. Mr. Lie began, in his native Korea, by creating couture looks for some of his country’s most high fashion women. He showed his ready-to-wear collection in Paris, then New York. It’s hard to see his looks and think “ready-to-wear”. Each piece is perfectly constructed, the architectural base, clean lines and mix of fabrics forming mini works of art. 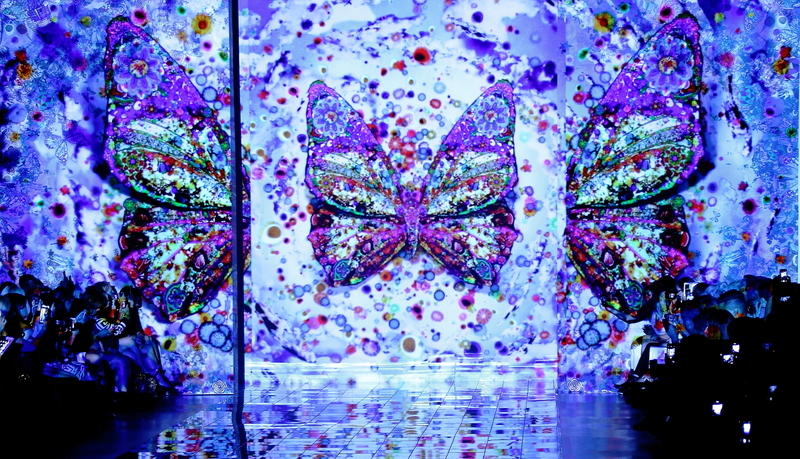 He called his collection “Dream Road” designed to “evoke optimism and celebrate life.” His prints feature butterflies, florals and clouds, the palate is white, turquoise, cobalt and purple. But beneath the joyful designs and colors is the most amazing structure and tailoring. Pleats, asymmetrical skirts, jackets and tops, digital printing and laser cutouts bring his luxurious fabrics, like silk jacquards, linens, organzas, chiffons and just plain cotton, to life. This is such as summer collection: the dresses flowed, pants were pin straight, and jackets, perfectly fitted. There were so many standouts in this collection, it’s hard to focus on any one. A rich, purple gown with a printed belt practically glowed, a chiffon skirt with an armor-like bodice, a perfect mix of softness and strength. Every print was breathtaking, the whites so clean and crisp. In his notes, he called the collection “ethereal”, and I can think of no better word. This was my first time seeing a Lie Sangbong collection. He was right, it lifted my spirits and made me want to see more. I can’t wait to see what he’ll bring for fall, when fashion always needs a lift. This entry was posted in Fashion and tagged Anton Brookes, Debora Fougere, fashion, Lie Sangbong, Lincoln Center, MBFW Spring/Summer 2015, mercedes benz fashion week, New York Fashion Week, Red Stiletto Media, runway. Bookmark the permalink.